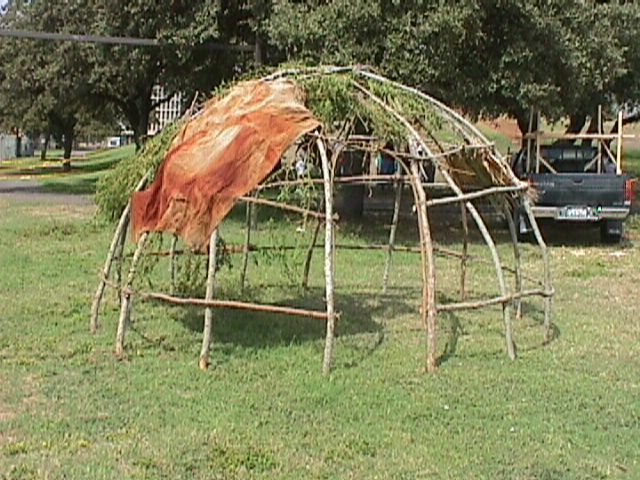 We built this wickiup right behind the Institute of Texan Cultures in San Antonio. 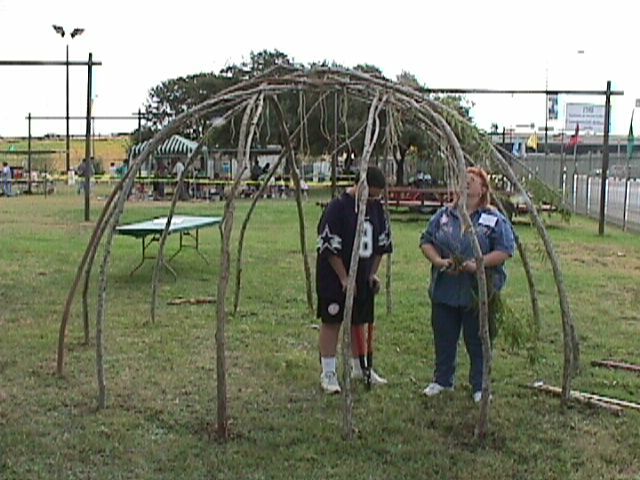 The event was the South Texas Archeology Association's Archeology Fair. October is Archeology month in Texas. To start the wickiup we went out and cut about 30 willow tree saplings -- nice long slender ones. They have to be green and flexible. We trimmed all the little branches off of them and saved the little branches for later. 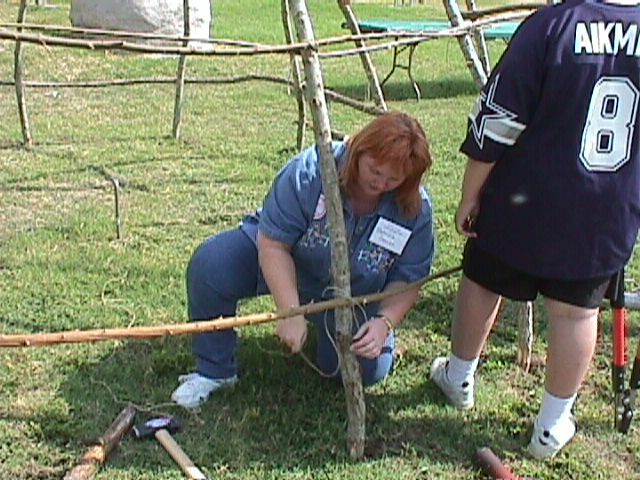 Next I drove a stake in the ground and used a string to make a circle. I marked where I wanted the willow poles to go. Next came the hard work of making holes in the ground to put the poles in. Man was the ground hard. I had to water the ground to make it softer. 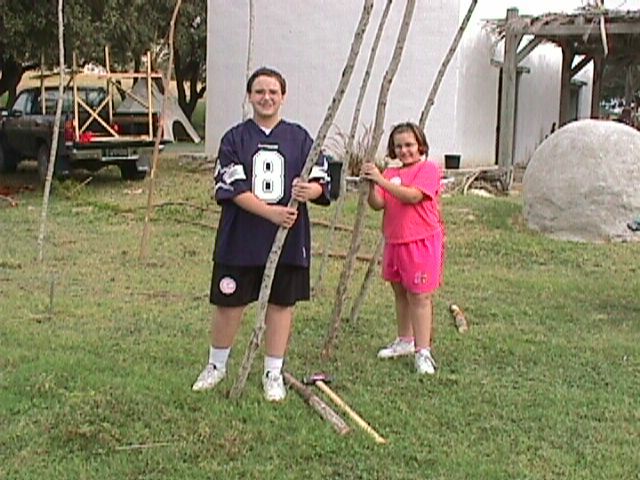 Here are Jonathan and Katie Garza helping put the poles in the ground. Here are all the poles stuck in their holes in the ground. 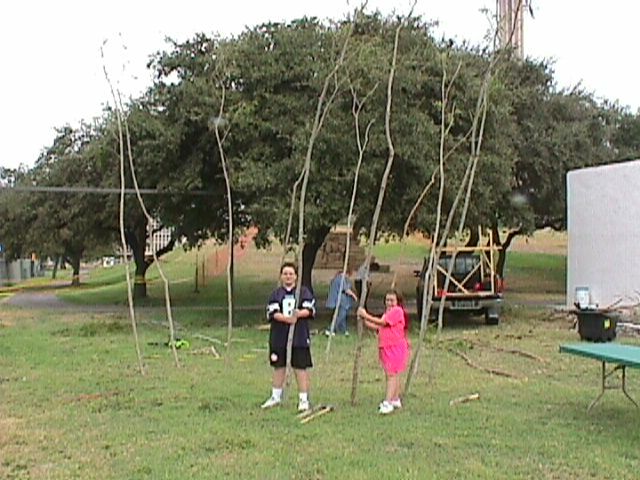 Next we bent the willow poles over two at a time. One from each side of the circle. Once they were bend into place we tied them with string. In the past strips of animal skin or sinew would have been used for this. Once all the poles were bent over we added rings of smaller willow poles around the sides and top. Here we are tying the side poles on. Here is the finished framework. Next we hang stuff to make shade and shed water on the outside and top. You can use almost anything. 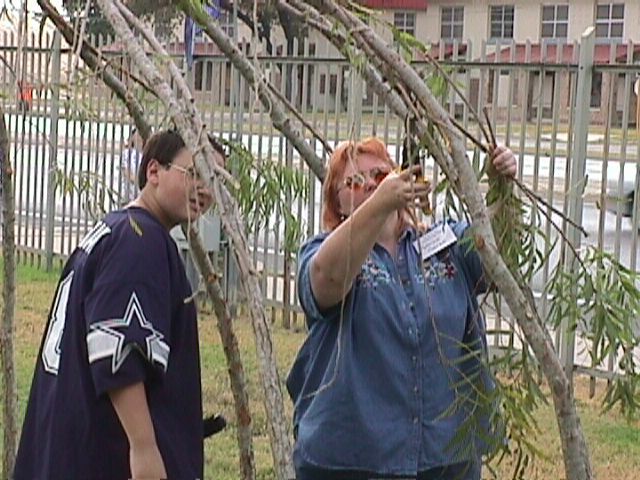 We used the small willow branches on part of it. You can use a blanket, or use an animal skin or woven grass mat just like the blanket is used here. Here are the willow branches we saved hanging on part of the side. 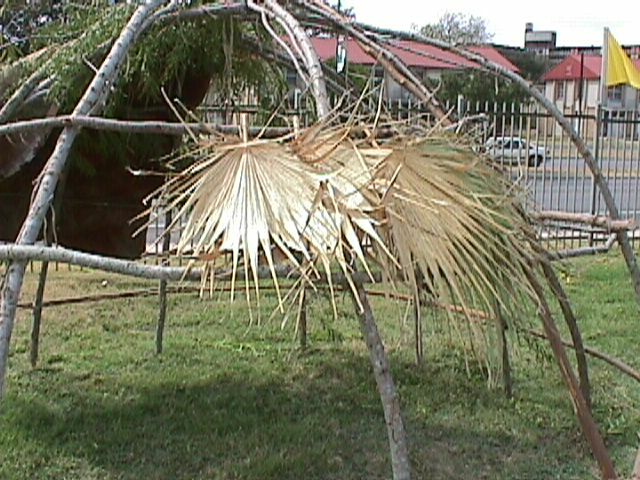 Here we used palm fronds. And that is how we built a wickiup!!! Here is a real version of a wickiup. 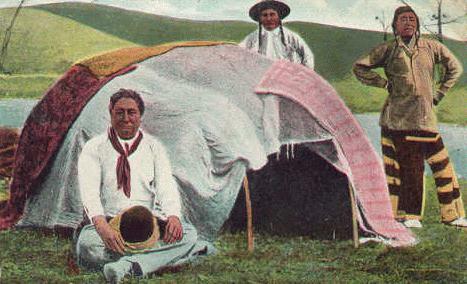 This is a sweat lodge. 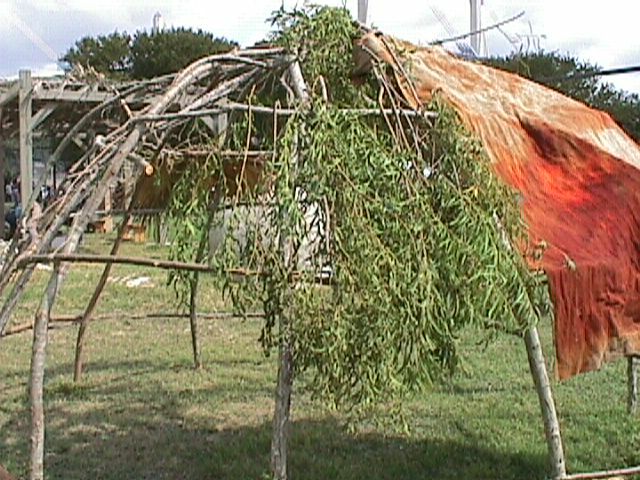 A sweat lodge is built to do religious ceremonies in. It is too small to live in. This one has old blankets thrown over it. You can see the willow saplings on each side of the door. The Indians here are from way up north, probably Dakota. Copyright 1999, 2012 by Rolf E. Moore and Texarch Associates, all rights reserved. Graphics may not be used or reproduced without prior permission. Short parts of text may be quoted in school reports. Longer quotes require prior written permission.